The symptoms of cellulitis are highly unpleasant, and not just in a cosmetic sense. The affected area is inflamed, swollen, a bit tender to the touch, and features a rash. Even without the potentially accompanying abscess or fever, cellulitis is not a condition you want to experience any longer than necessary. Consequently, there are a number of home remedies for cellulitis you can employ to speed up your recovery and help ensure a better outcome. Your skin is home to a number of different strains of bacteria, including the streptococcus and staphylococcus families. Most of the time, these bacteria are harmless, but they are also opportunistic. Staph and strep bacteria can enter the body through any cracks or breaks in the skin, such as from a cut, surgical wound, or insect bite. Once inside, the bacteria can spread surprisingly quickly. For the record, other types of bacteria can cause cellulitis, but the most common culprits are staph and strep. The affected area will be swollen, tender, sore, and warm to the touch. Red spots, blistering, and skin dimpling can also appear, but this isn’t as common. The rash can also expand rather quickly and will appear to grow over the following days, potentially covering entire limbs. As the condition progresses, the lymph nodes may become swollen and hard. When looking for the symptoms of cellulitis, be very alert for signs of a fever along with chills or nausea. A fever could indicate that the bacteria have spread beyond the skin and complications may arise. If you have cellulitis, you should consult with a doctor at the earliest possible time. If you have cellulitis with a fever or chills, seek emergency care immediately. A word of caution: if you are diagnosed with cellulitis, your doctor will prescribe antibiotics. It is essential that you take these, since cellulitis can spread rapidly and progress to potentially fatal or crippling complications if left unaddressed. While you are free to try some of the natural treatments for cellulitis listed below alongside prescribed antibiotics, they should never be used as a replacement for conventional care. 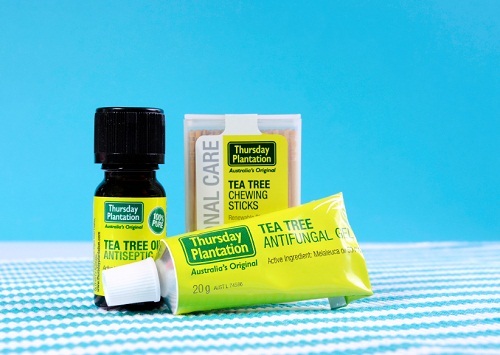 Tea tree oil: Tea tree oil has mild antiseptic properties and can be applied topically to the site of your cellulitis. Add one or two drops to a moistened cotton swab and dab onto the cellulitis and leave it for a few hours. A few drops can be mixed into aloe vera gel or raw honey as well. Do not ingest tea tree oil, however, since it is poisonous. Tea tree oil is also very acidic, which is why diluting it in another substance is important. Calendula: This is a flower family that can help soothe inflamed and tender skin. Steep two teaspoons of calendula flowers in hot water for 10 minutes. Then, dip a clean cloth in the mixture and wrap or lay it on the cellulitis rash for 15 to 20 minutes. Repeat three more times each day. Manuka honey: This is a type of honey from New Zealand that is known to inhibit the growth of staph in lab tests. Simply spread the honey over the cellulitis rash and leave it for a few hours before washing it off. This treatment is not for everyone, however. Manuka honey is somewhat acidic and can irritate sensitive skin and, in some cases, cause an allergic reaction. Manuka honey should also not be used without talking to your doctor first, since it can interfere with certain drugs. Pineapples: Pineapple contains an enzyme called bromelain that can reduce inflammation. The best part is that you can just eat the slices instead of trying to apply them to your skin. Massage: While generally you do not want to put much pressure on a cellulitis site, there is a certain type of massage, called “manual lymphatic drainage,” that is designed to promote the flow of lymph fluids and help keep the body’s lymph nodes from getting clogged. Manual lymph drainage requires a specific technique, so ask your doctor if they can recommend a practitioner. Deep-layer tissue infections, including necrotizing fasciitis, a form of flesh-eating strep. Anyone with a weakened or compromised immune system, such as from age or HIV. Diabetics, since the ulcers the condition can promote bacterial growth and possible weakening of the immune system. Anyone with circulation problems, since proper blood flow is necessary for normal immune response. Anyone with conditions that cause skin blisters, such as chickenpox, since popped blisters are possible avenues of infection. Anyone with conditions that increase the likelihood of cracked skin, like lymphodema or eczema. Those who have recently had surgery. Those who use illegal intravenous drugs without access to clean needles. Those with a past history of cellulitis. Treat cuts properly with antiseptic ointments and use bandages for larger wounds until the skin heals. Take common-sense steps to reduce the likelihood of injuries such as using proper protective equipment, for example when working, biking, or gardening. Moisturize dry skin to keep it from cracking. Eat a balanced, healthy diet to keep your immune system robust. “Cellulitis – Symptoms,” Mayo Clinic web site, February 11, 2015; http://www.mayoclinic.org/diseases-conditions/cellulitis/basics/symptoms/con-20023471, last accessed February 29, 2016. “Cellulitis – Complications,” Mayo Clinic web site, February 11, 2015; http://www.mayoclinic.org/diseases-conditions/cellulitis/basics/complications/con-20023471, last accessed February 29, 2016. Nordqvist, C., “Cellulitis: Symptoms, Causes, Treatments,” Medical News Today web site, February 5, 2016; http://www.medicalnewstoday.com/articles/152663.php, last accessed February 29, 2016. Normandin, B., “Cellulitis,” Healthline web site; http://www.healthline.com/health/cellulitis#Overview1, last accessed February 29, 2016. Planinz, T., “Are There Herbs for Cellulitis?” Livestrong web site, September 18, 2013; http://www.livestrong.com/article/241806-herbs-for-cellulitis/, last accessed February 29, 2016. Pulugurtha, S., “How Effective Is Manuka Honey at Treating All Forms of Staph Infections?” Livestrong web site, October 5, 2015; http://www.livestrong.com/article/526231-how-effective-is-manuka-honey-at-treating-all-forms-of-staph-infections/, last accessed February 29, 2016. “Cellulitis,” University of Maryland Medical Center web site, http://umm.edu/health/medical/altmed/condition/cellulitis, last accessed February 29, 2016.